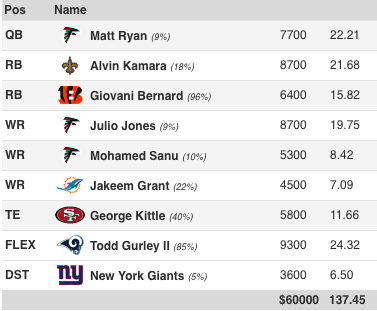 On Sunday, a team being implied to score the third most points on the slate won a few lucky users $1 Million, and it was the first time a stack of a team with a higher implied total than 23.5-points won these flagship contests in 2018. In Week 1, the Buccaneers stack took down both sites (20 implied points) and last week the Vikings’ double stack won all the money (23.5 implied points). In Week 3, the game with the highest implied total (over/under of 54 at closing) finally lived up to its billing. 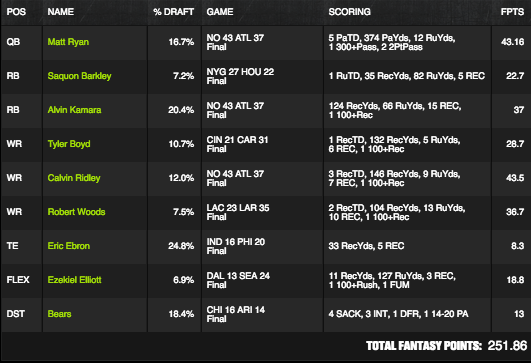 Onto our NFL DFS GPP Recaps. In other words, with a bit of customization, fantasy owners could have come to a very similar conclusion to this lineup. However, as Mike Leone pointed out our low projection on Calvin Ridley proved to be a costly one. 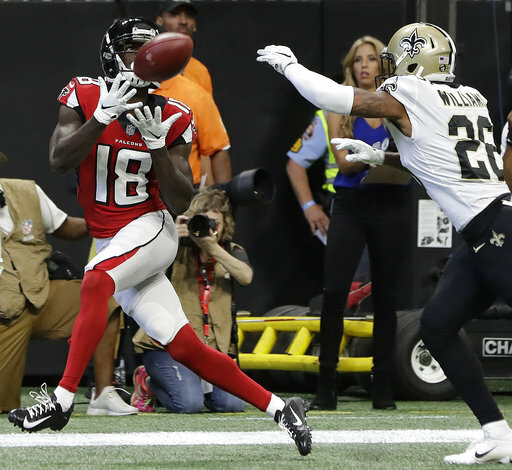 The plays that stand out here are the 1.1-percent owned Rams Defense and the 1.6-percent owned Ted Ginn Jr. Reports of Cameron Meredith acting as the starter opposite Michael Thomas emerged pre-kickoff so the Ginn Jr. play certainly took guts…and paid off due to one scoring play (and not even in the usual taking the top off the defense fashion fantasy owners have become accustomed to with Ginn Jr.). Even though the Rams lost a few starting corners this week due to injury, the defense still produced for the few who took a chance on them as they scored on a blocked punt. This was one of those scenarios where the Gurley/Rams defense correlation paid off as the team was playing from ahead and the defensive TD did not take away from the offense enough to slow down Gurley. In the first three weeks, this is the first time the RB/defense correlation has led to shipping any of these tournaments analyzed in the article. In the DK Play Action contest ($100,000 to first), user “BemoDolfan” rode the Drew Brees/Alvin Kamara/Michael Thomas/Benjamin Watson Saints team stack to victory paired with Ridley to run back the game stack. Included in this lineup was 1.4-percent owned Mike Williams and 14.9-percent owned Jordan Howard in a game where the Bears closed as 6.0-point road favorites. If/when a shootout goes to overtime, going heavy on the players can pay off in a big way, and this is a prime example. Four players on the same team won a tournament with over 673,000 entries in this case and one of the members in the stack did not even go off (Watson). 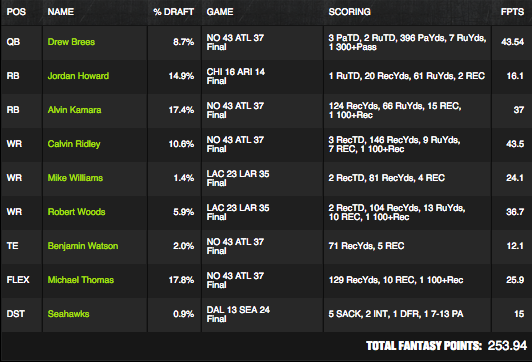 “BemoDolfan” entered his same lineup twice in this contest with just a $3 entry and he ended up finishing both first and second. On Sunday, that was the magic recipe that led to epically turning $6 into $150,000. The first thing that stands out in his builds is the attention to the Saints/Falcons stack in the top exposures. Choosing the correct game is obvious but taking a huge stand on a specific game can truly give you an advantage on the field if/when it hits and this was one of those occasions. When taking such a strong stand, it makes sense to limit exposures to below 70-percent, so hedges can come through just in case the main stack fails. This week would have been poor for “mjordantmac” had the main game he stacked ended 14-10 regardless but that was the risk he calculated by going heavy on the stack…and the game went to overtime. Whereas other professionals had focused on top values, it was intriguing to see the contrast with a player who focused on an entire game. A unique approach from “mjordantmac” led to his one entry netting him $14,700 for the day (before taking into consideration his other profitable entries).